Kevin O'Connor says he is proud to be in line for his 500th Brentford match when Stevenage visit on Saturday. The Bees' final League One game of the season will see them celebrate promotion and mark O'Connor's landmark. "It means an awful lot and makes me very proud. To say, hopefully, I've made 500 appearances is just amazing," the versatile 32-year-old said. "Hopefully it'll be a great day and something I'll look back on in the future and feel proud." A product of Brentford's youth academy, O'Connor signed professional forms in 1999 and made his senior debut in February the following year. He started his career as a striker and has since played in midfield and defence, establishing himself as a hugely popular figure at Griffin Park. "I've been very lucky. Managers have wanted me and I think I've had to reinvent myself a few times as well - change positions and try to adapt with the times," he told BBC London 94.9. "All I've done is work hard and try to listen to what good advice managers have given me." 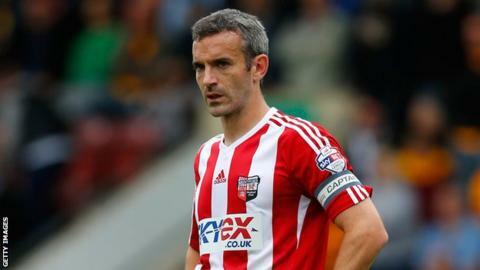 O'Connor lists this season's promotion to the Championship as the highlight of his time at Brentford and believes the club has been transformed by the investment made by owner Matthew Benham. Training facilities have been vastly improved and a new stadium will be built at Lionel Road. O'Connor recently signed a new one-year contract and will also take on coaching duties under manager Mark Warburton, who sees him having a significant role at Brentford in the future. "There have been major changes. We were running as a Championship club this season," O'Connor explained. "We used to wash our own kit, used to change at the ground and then go to parks and train. "It's been a massive change, even in the past four years. It's a different club and this is the way it should be done. The club's going places. "I love this club and whatever I can do to help would be great. The manager has offered me this role which I'm keen to take and it really does excite me." Warburton said: "You couldn't write the script - 499 games and we've just got promotion. I'm delighted for Kev. "I hope at the end when the players do a lap of honour Kevin really has the chance to wallow in it. He's earned that. "Kev's been here a long while and seen many changes, which is why I'm desperate for him to stay. "Kev will play a big part in the club going forward, I'm sure."